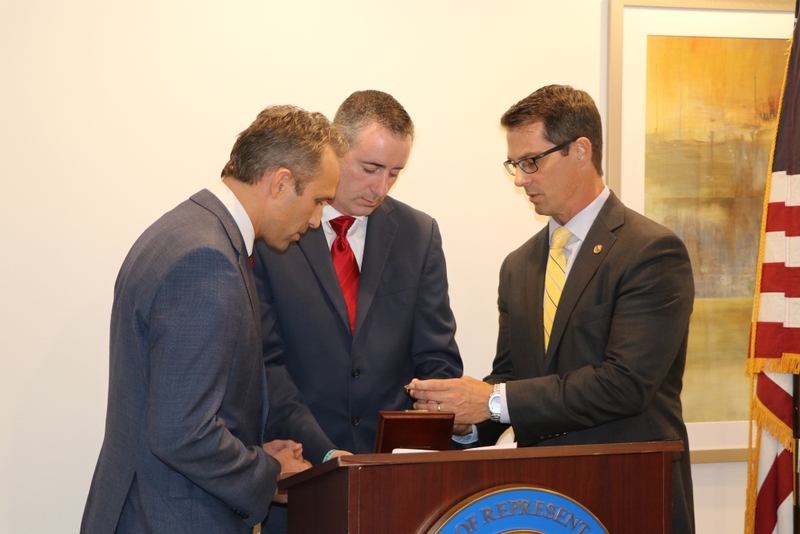 From left, U.S. Rep. Brian Fitzpatrick, Carnegie Hero Kristian F. Falkenstein, and Hero Fund President Eric P. Zahren examine the Carnegie Medal presented to Falkenstein at an Oct. 16 ceremony held in Langhorne, Pa. In September 2017, Falkenstein, then 39, of Newtown, Pa., helped save a man, 32, from drowning in the ocean in Belmar, N.J. Falkenstein swam 300 feet to the man and, despite turbulent ocean conditions and a strong current, persisted in efforts to keep him afloat. A police officer and two lifeguards, all with flotation devices, responded to the pair, but they could not swim out of the current. All five men were removed from the water by a Coast Guard boat that had responded. Fitzpatrick represents Pennsylvania’s eighth district.